March 23 and 24, 2010 – The Employer Council of Champions hosted Ottawa employers at its third annual Summit, Leadership, Collaboration and Innovation: The Key to Addressing Ottawa’s Talent Needs. The first day of the Summit included a learning exchange for managers with human resources and staffing responsibilities, as well as a networking reception for employers and skilled immigrants. The second day featured a keynote address by Dr. Linda Duxbury from Carleton University’s Sprott School of Business, a moving account of one immigrant’s successful journey to skills-appropriate employment, as well as the presentation of the Hire Immigrants Ottawa’s 2010 Employer Excellence Awards. March 23 – Learning Exchange: In their keynote The Innovation Advantage: How Employers in Ottawa can Benefit from Hiring Skilled Immigrants, the Conference Board of Canada’s Diana MacKay and Michelle Downey provided participants with a sneak preview of soon-to-be-released research that demonstrates the link between immigration and innovation. Participants also heard from a panel of experts on mentoring, bridge training, inclusion, and celebrating diversity. The day’s activities concluded with a networking reception hosted by the HIO Working Groups, where employers and skilled immigrants were able to connect in an informal setting. This event offered skilled immigrants the opportunity to meet with hiring managers, improve their networking skills and learn valuable information about job search in their sectors. March 24 – In her keynote address, Dr. Linda Duxbury called on employers to prepare themselves for the transformational changes they will need to make to survive the demographic change propelling the labour scene from a buyer’s market to a seller’s market. Citing global and local statistics, Dr. Duxbury noted that, for every retiring “workaholic” baby boomer, at the very least, two workers with the new work-life-balance orientation will be required to replace them, and Canada is only producing one. While previous generations of workers competed for jobs, employers will now be competing for skills. The enhanced diversity provided by immigration will be just one of the mechanisms needed to address the demand, she said, but without it, employers will be lost. Alberta Lawson (pictured above), a Senior Personal Banking Officer at Scotiabank, shared her experience in traversing the challenges of securing a fulfilling job. 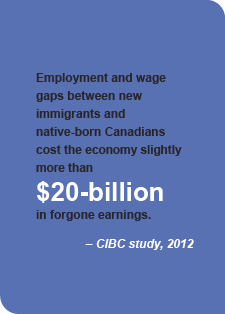 In the face of the considerable labour market implications brought on by rapidly changing demographics, the ECC called Ottawa’s employers to action. With declining birthrates, decreasing numbers of post-secondary graduates and a coming wave of retirements, Ottawa’s employers face impending skills shortages. 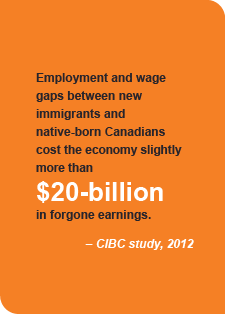 They need to prepare their workplaces for the effective recruitment and integration of skilled immigrant talent. Employers will also have to collaborate with each other and other stakeholders to take full advantage of the skills that immigrants bring to the city. Understand the need for transformational change and become change agents. 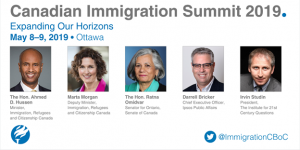 “We need to do more to fully integrate our highly skilled and educated immigrants into our workplace if we want to maintain our position as their destination of choice. Communities that are best able to do this will be economic leaders,” said Rosemarie Leclair, President and Chief Executive Officer of Hydro Ottawa Group of Companies and ECC Co-Chair. From left: Joanne Tapp, Revera Health Services Inc; Manu Sharma, OCRI Talent Bridge; and Catherine Frederick, City of Ottawa. The City of Ottawa was recognized in the large-employer category for outstanding practices in the recruitment of skilled immigrants. The City developed its “Equity and Inclusion Lens” as an HR tool within its hiring process. The tool guides the development of policies and programs that address systemic barriers in the recruitment and promotion of workers with diverse backgrounds, including internationally trained individuals. By increasing diversity in the workplace, the City seeks to better reflect the community it serves. The City for All Women Initiative and the community collaborated to develop the tool. Previous award recipients include the University of Ottawa, Human Resources and Skills Development Canada (HRSDC), Algonquin College and GEM Health Care Services Inc.
Read about the 2009 Employer Excellence Awards winners.